I know, St. Patrick’s Day was yesterday. I am just posting here to let everyone know, if for some reason you didn’t get our email flyer for St. Patrick’s Day, that our current sale is the following. Order any 3 items and we will ship your package USPS Priority 2-3 Day Mail for free. We always have free shipping on everything we sell. If you order 3 or more items until end of day Monday, the 22nd of March, 2010, we will not only ship your item for free–we will ship it Priority. 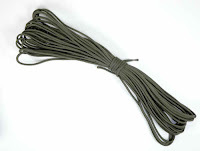 And we will also send you 50′ of free 550 Paracord. Just type the word CORD into the coupon line and we will make everything else happen.